I have little idea where the intersection point of the Venn diagram that is “Takeout” came from. 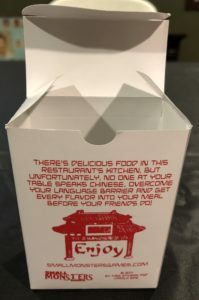 Perhaps the designers were sitting in their living room with friends and dozens of takeout containers of their favorite Asian style food strewn about the coffee table, watching the latest episode of Orange is the New Black when the metaphorical light bulb went off, or maybe they were just trying to order up some grub while backpacking through China before the days of Google Translate. At the end of the day, the story behind the design aesthetic doesn’t really matter. What really matters is how it plays. Above And Below: Box art front and back, It’s simple, clean, and reminds me of a takeout container. 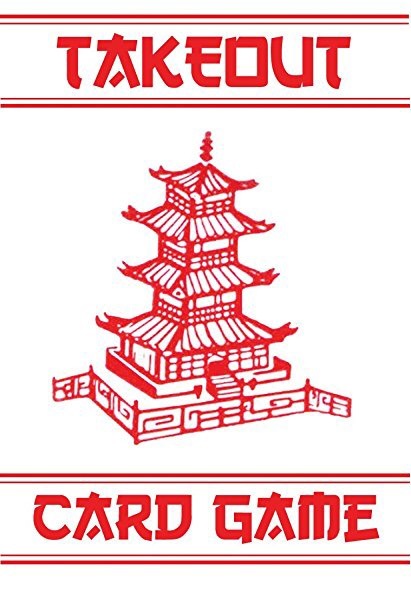 “Takeout” is, at its core, a collection game. You are trying to piece together a complete meal by collecting various dishes representing six distinct flavors: salty, sweet, spicy, bitter, sour and cold. All the while trying to stop your fellow diners from completing their meals. What makes this game particularly interesting though is the use of action cards. As is the case with basically every other card game ever created, action cards exist to break the games rules. 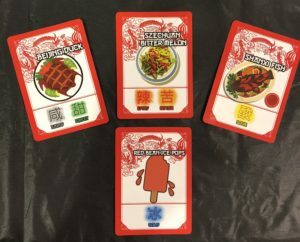 With “Takeout”, the action cards function AS the games rules, and managing them is more essential than managing the dishes on the table in front of you. 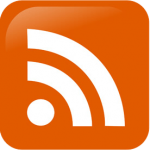 Which function solely as placeholders. 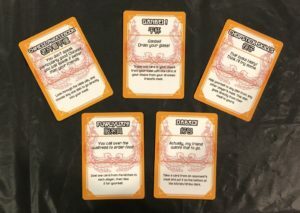 You will not win a hand of this game without judicious and frequent application of the action cards, and very often I found myself angrier when having to discard an action card than a food item I needed. You simply cannot rely on drawing what you need out of the deck. Unless the card gods are forever in your favor, stealing, trading, or removing dishes from your opponents table is the most expedient (and fun) route to victory. 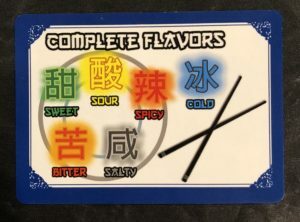 Above: A complete “Meal” notice that each of the six flavors has been acounted for, it doesn’t matter if you have multiple dishes on the table with the same flavor, just that you collect all 6. 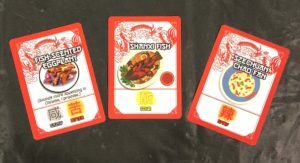 Above: The Action Cards, these cards are the backbone of the game, and using these is the ONLY surefire way to achieve victory. I have to say, there is simply not a facet of this game I did not enjoy. 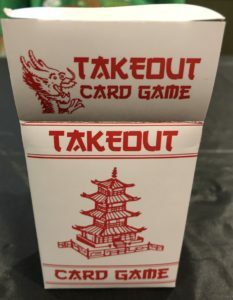 Everything from the design of the box art, which evokes an Asian food takeout container, to the viciously fast and fluid gameplay, Takeout is the complete package. It’s family friendly, easy to teach, and in today’s low attention span world with most games only taking about 5-7 minutes to complete the tweens in your life can get back to Tweeting and Snapchatting about the latest Justin Bieber album that much sooner. I’ve said before I’m always on the lookout for great “backpack games” and at right around $17 “Takeout” most certainly fits the bill for a perfect “backpack game”.